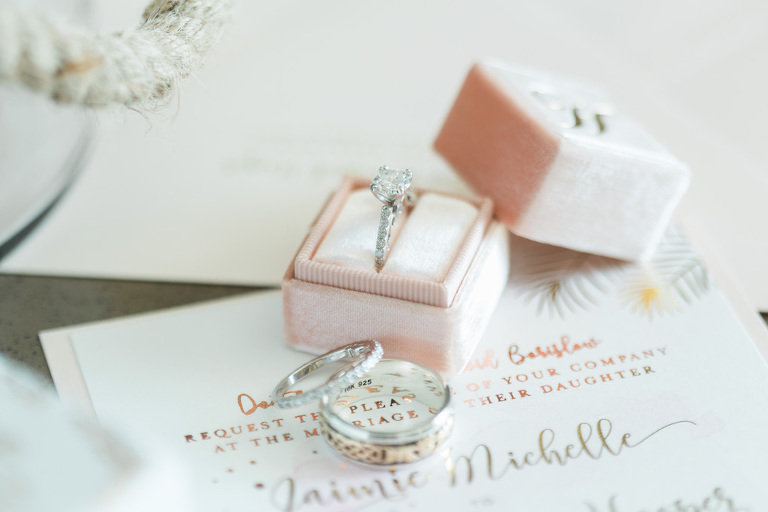 Jaimie and Patrick’s glitzy Clearwater Beach wedding featured a romantic color palette and a “From Mizzou to I do” theme. 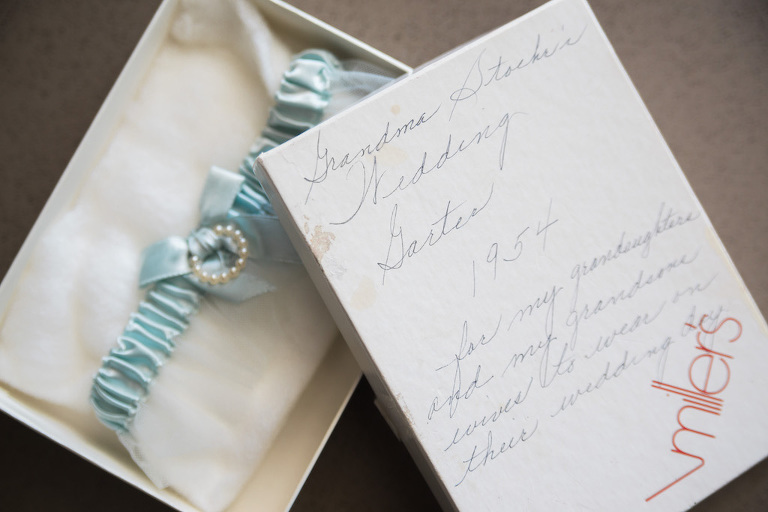 The California bride grew up in Indian Rocks Beach and wanted to get married near her hometown. To assist during the wedding planning process, she researched vendors and inspiration on Marry Me Tampa Bay. 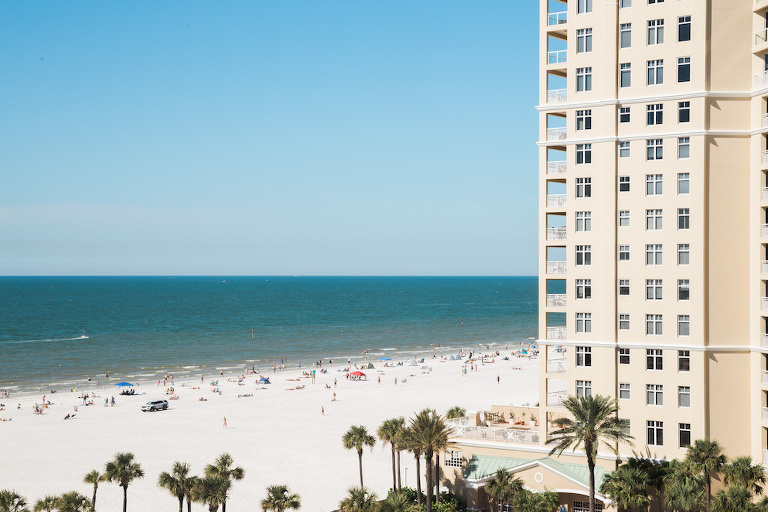 Searching for a Clearwater Beach wedding venue that would serve as a relaxing weekend vacation spot for their out-of-town guests, the destination couple selected for the newly renovated Hilton Clearwater Beach. “We wanted a ceremony space that was unique and offered great views of the beach. For the reception, we wanted a large ballroom with a lot of space for dancing and an area where people could lounge comfortably,” the bride explained. “We went on many tours throughout Tampa Bay, and loved a lot of venues, but the Hilton Clearwater Beach was just perfect for us. We used their Sandpiper Deck as our ceremony space, and it was exactly the kind of place I’d hoped to find. It was so serene, and the view of the sun setting on the ocean was perfect for our cocktail hour. I can’t say enough good things about the Hilton’s service. Every aspect was perfect. Courtney Owens was a dream to work with. She really took time to understand my vision and help me bring it to life. For the bride who believes in the motto, “you can never have enough sequins,” Jaimie searched for a Tampa Bay rental company specializing in draping and furniture rental to transform her reception space into a lavish glistening oasis. The couple focused on the small details that reflected each of them. For the bride, she handmade 215 paper flowers for the place settings, while the groom broke out in song, literally. “Patrick plays the bagpipes, so we knew we’d want him to play at the reception as a surprise for everyone. We decided a perfect combination of our families (his is Irish, mine is Jewish and Irish) would be to have him play Hava Nagila before we danced the Hora. He did, and it was so fun!” Jaimie gushed. Looking back, the bride reflected that one of her most memorable wedding day moments was the father/daughter dance. “My dad and I went to Daddy/Daughter date night at the Largo Rec. from the time I was 5-years-old all the way up until my freshman year of college. My dad and I are really close, and we both love to dance. I wanted to surprise him with something fun, so I had the band play our chosen song, My Girl by The Temptations, and then halfway through they switched into Last Dance by Donna Summer, a song we loved dancing to at Daddy/Daughter date night every year. It was so great to see his face when he realized what they were playing, and we had so much fun dancing!” the bride reminisced. What was your bridesmaid dress inspiration? I really loved the look of mix and match dresses and having 12 bridesmaids I thought it would be especially nice to break it up with different styles and materials. This also allowed for everyone to have a style they were comfortable with. I knew that I wanted to have blush and sequins, so we went with blush and rose gold. I wanted them to have a lot of different textures, some with beaded patterns and some with lace. It was really fun picking out all of the dresses with my bridesmaids, and then praying they all looked okay together when the time came. I chose Bella Bridesmaids because they have shops across the country, so I was able to go to one near me in Los Angeles, and my bridesmaids then could easily go in to the stores near them to see the styles I’d selected. My bridesmaids live in California, Missouri, Arizona, Washington, Wisconsin, and New York – so using Bella Bridesmaids made everything a lot easier. It was also perfect because while I loved the idea of mix and match dresses, I had no idea where to start – so it was great to go in there and pull a bunch of dresses I loved and then line them up together to start to get an idea of what looked good. I think everyone was really happy with their dresses, and their service was great. First and foremost, I wanted a place that all of our out-of-town guests could come to and really feel relaxed and on vacation. We wanted a ceremony space that was unique and offered great views of the beach. For the reception, we wanted a large ballroom with a lot of space for dancing and an area where people could lounge comfortably. We went on many tours throughout Tampa Bay, and loved a lot of venues, but the Hilton Clearwater Beach was just perfect for us. We used their Sandpiper Deck as our ceremony space, and it was exactly the kind of place I’d hoped to find. It was so serene and the view of the sun setting on the ocean was perfect for our cocktail hour. For the reception, they have a huge ballroom, which was so customizable, and I loved that it is in the back of the hotel so it felt very private. I can’t say enough good things about the Hilton’s service. Every aspect was perfect. Courtney Owens was a dream to work with. She really took time to understand my vision and help me bring it to life. She was so flexible with every aspect of the wedding: swapping entrees out on the menu, customizing the bar times and working with all of my vendors. The service the weekend of the wedding was honestly outstanding. Everyone working at the reception was so attentive. I truly still have people commenting to us today about how much they loved their server! The service at the Hilton was outstanding. It truly could not have been better. I didn’t realize while planning how important having a good wait staff was going to be, and they made the night perfect. Patrick and I met in college at The University of Missouri a.k.a. Mizzou. Homecoming is huge at Mizzou, and in college I was a part of the committee that planned the homecoming events, so homecoming weekend has always been very special to me. Our college campus is my favorite place on earth. Patrick proposed to me at the start of homecoming weekend in front of the historic columns on our campus quad. It was a complete surprise, and I was even more surprised to find that my parents flew in from Florida to celebrate with us. It was so fun because all of our best friends flew in from all across the country, so I got to surprise them with the news one by one, and we celebrated all weekend long. I really wanted a vibe that was light, romantic and whimsical. We felt like it was breezy and calming. 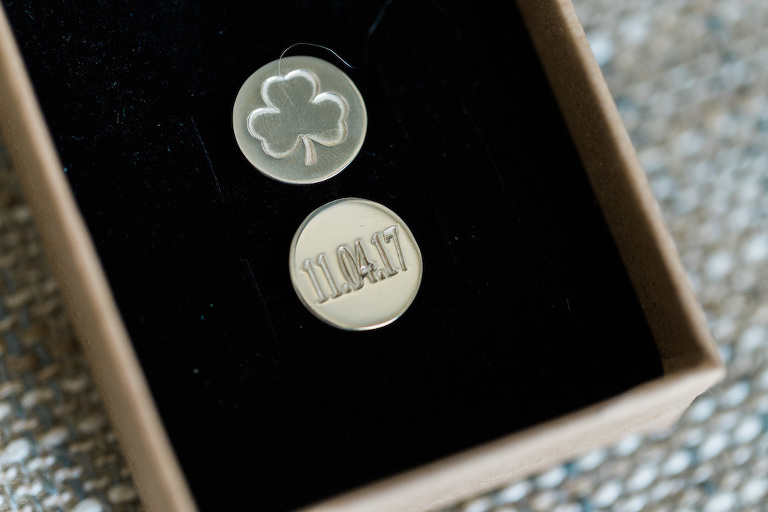 We played up the theme “From Mizzou to I do” on a few different items, like our Save-the-Dates and coasters. Gold, rose gold, blush and ivory. We knew right away that we wanted one of our colors to be gold, because that is one of Mizzou’s colors. I love pink and mixed metallics, so we also did blush and rose gold. Then, we chose ivory to keep things light. What did you look for in a wedding draping and furniture rental company? I had a lofty goal for draping the ballroom, but I did not have a lofty budget for it. I wanted a company with a good reputation that would work with me to help achieve the look I wanted. I sent out a lot of emails for quotes, and Kabe of Gabro Event Services gave me a call, and we chatted about my vision. He was so nice, worked with my budget, and was able to drape everything just as I’d hoped. So, it was a no brainer when he told me that they also did furniture rentals. We went to their showroom and everyone we spoke to there was so kind. They made the whole thing stress-free. Tampa Bay is one of the most beautiful places on earth and there are so many amazing vendors you can choose from. Take the time to talk to them on the phone or even exchange a few emails. All of our vendors were so helpful and kind; it ended up feeling like I was assembling an amazing wedding team. Having a bunch of experienced people on your side makes everything a lot less stressful.